In Flanders and Brussels, Norkring België owns a complete infrastructure for broadcasting radio, television and data signals over a digital terrestrial network. Our transmission tower in Sint-Pieters-Leeuw – the tallest construction in Belgium – is the central node of our network. Here, the television, radio and data signals from our customers are processed before being sent through our own fiber network to our transmission towers all across Flanders. The transmission tower was designed in 1988 by the renowned architect from Hasselt, Alfredo De Gregorio, and was built between 1991 and 1994. 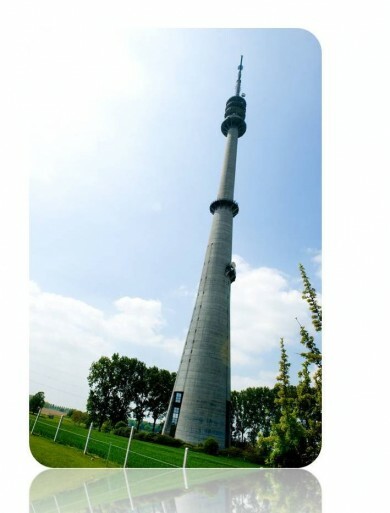 The tower is 300 metres high, which is the same height as the Eiffel tower in Paris, and it is also the highest concrete construction in Belgium. The diameter on the ground is 27 metres, and at the top only 160 centimetres. In the lower part you can find the transmission building and the offices, spread over 4 floors. At 193 metres height there is a dome with all communication equipment. Since 2009, the transmission mast is owned by Norkring België.